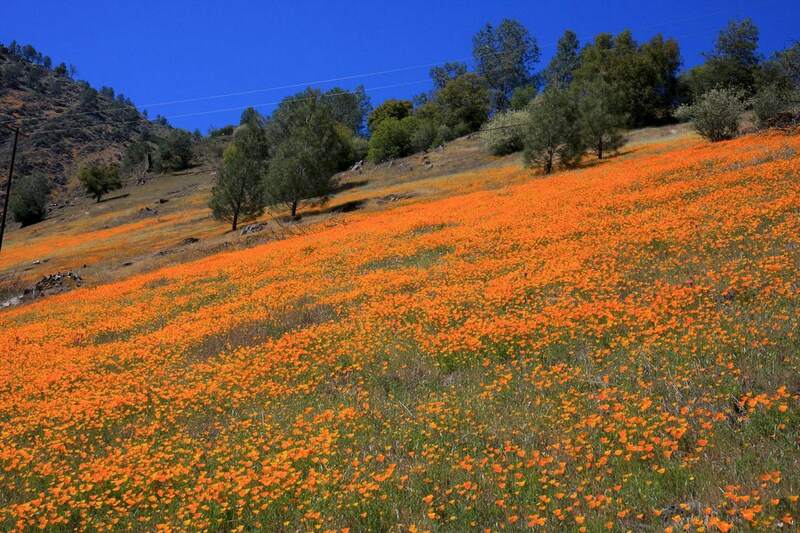 Wondermondo has listed 10 gorgeous California poppy meadows below, in alphabetic order. 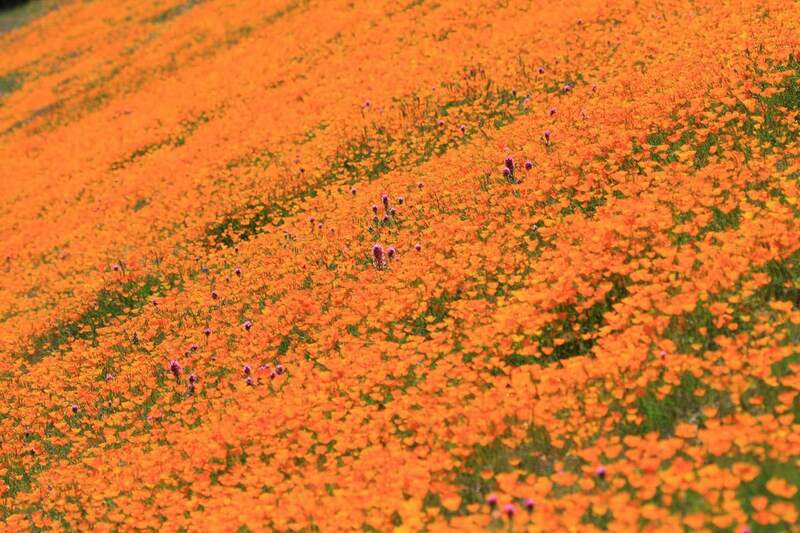 This could be the most impressive California poppy meadow. 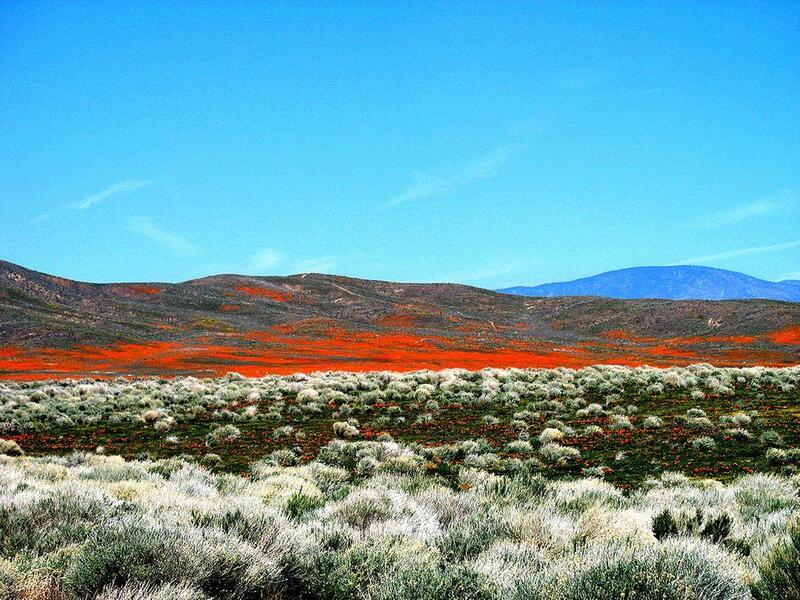 This meadow is located in the western part of Antelope Valley. Nature reserve was created here in the 1960s. Area of the reserve is 1,777 acres (7.19 km2), state has arranged also tourist facilities and nature trails. These are the largest remaining Californian arid grasslands next to Antelope Valley and Carrizo Plain. Bear valley is desolate and vast and very rich not only with California poppy but also creamcups (Platystemon californicus Benth. ), adobe lilies (Fritillaria pluriflora Torr. ex Benth.) and many other wildflowers. Carrizo Plain is one of the most unique natural complexes in California, a vast remnant of arid grasslands. 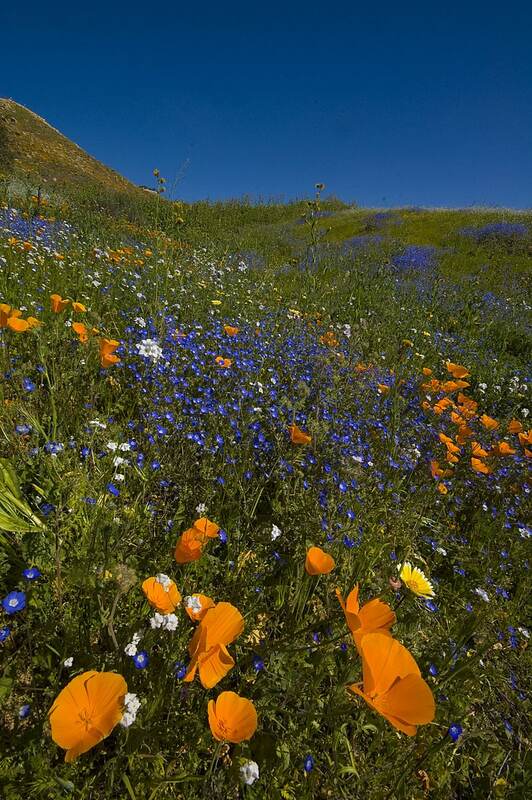 Here are large meadows with diverse wildflowers such as California goldfield (Lasthenia californica DC. ex Lindl. ), lacy phacelia (Phacelia tanacetifolia Benth. ), California poppy (Eschscholzia californica Cham. ), tidy tips (Layia platyglossa ( Fisch. & C.A.Mey.) A.Gray) and numerous other species. Sycamore alluvial woodland together with open grassland further away from the creek provides one of the most impressive floral displays in this part of California. Landscape is made even more impressive by the fact that it is partly restored after closure of gravel mine. 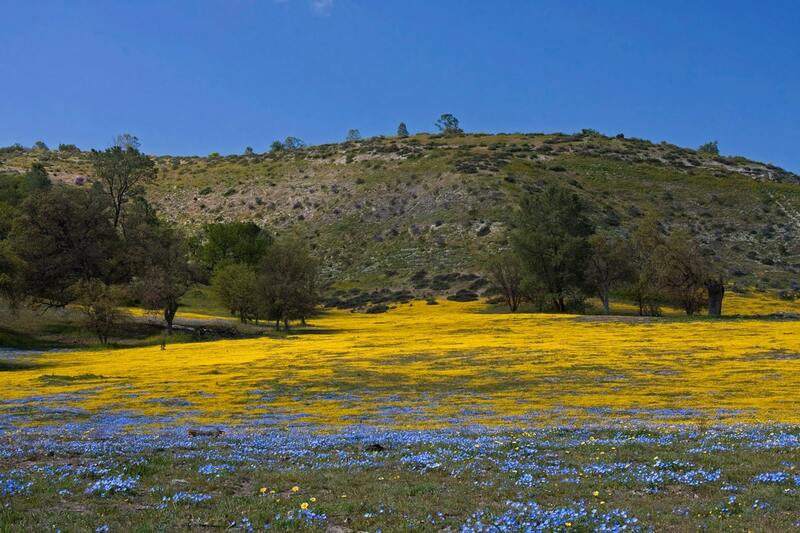 Hillsides of the Figueroa Mountain represent a beautiful, refreshing sight in spring – lush meadows full with flowers. Add a stately backdrop of forested mountains and you get a perfect landscape. Hillsides are covered here with sky lupines and California poppies. For diversity in many locations one can see patches of magenta padre’s shooting stars (Dodecatheon clevelandii Greene), chocolate lilies (Fritillaria biflora Lindl.). In more open areas there are rich displays of goldfields (Lasthenia ssp.) and numerous other flowers. Not too far from the famous Antelope Valley poppy meadows there is another well-known location where in spring-time there can be observed magnificent florescence of Californian flowers. Most common flower species here are the yellow California tickseeds (Coreopsis californica (Nuttall) H. Sharsmith), blue Bentham lupines (Lupinus benthamii A.Heller), blue bluehead gilias (Gilia capitata Sims) and lacy phacelias (Phacelia tanacetifolia Benth.). The beautiful California poppies ((Eschscholzia californica Cham.) add orange accents and in many places they form larger golden colored meadows. One of the most popular routes in the Yosemite National Park is Highway 140 along the Merced River. When approaching the Yosemites the valley gradually becomes deeper and deeper. In springtime the beautiful landscape is even more beautiful – millions of poppies color the high hillsides on both banks of the river bright orange. Lake Elsinore area is located in the Greater Los Angeles Area and here live approximately 16 million people. Some areas near Los Angeles though have been spared of urban development and are even relatively intact. One of such places is seen from I-15 highway between Alberhill and Lake Elsinore. Desolate hills rise in both sides of the road. For most part of the year these hills seem to be nearly lifeless. 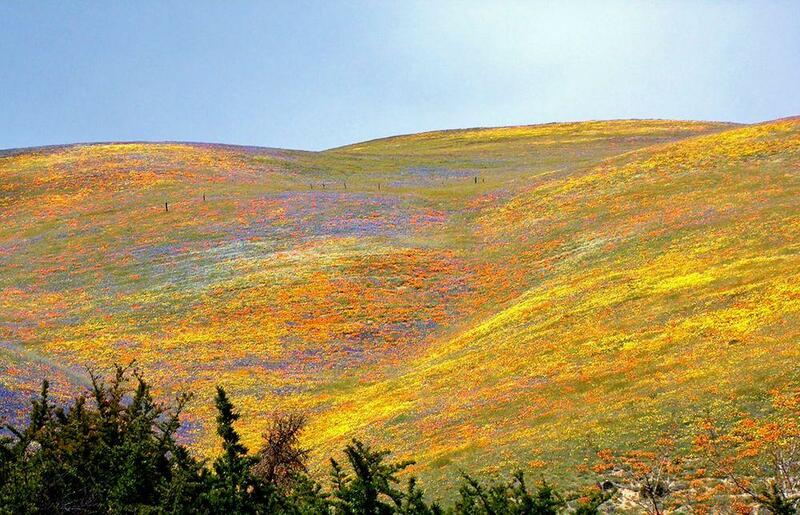 But in the spring – in late February – April – there happens miraculous change – greyish hills become covered with large bright colored patches of wildflowers. 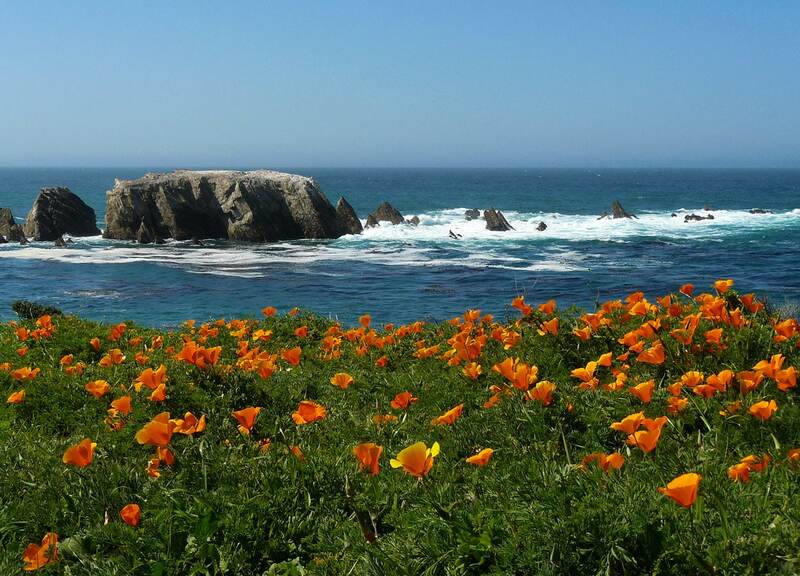 One of the best seaside Californian poppy meadows is located at Point Buchon. Often in spring this approximately 6 km long and up to 0.8 km wide stretch of seaside plain is covered with millions of bright orange California poppies. For long years these beautiful meadows were closed for public but since 2007 – 2008 up to 275 people per day are allowed to enjoy them. 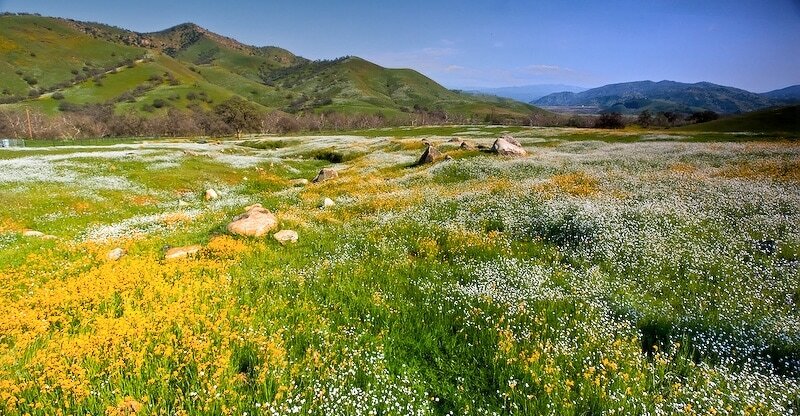 The diverse and beautiful Shell Creek meadows can serve as a teaching ground for learning the Californian wildflowers. Undulating hills with occasional groups of trees and gallery forest along Shell Creek form a lively landscape. Further towards the north the valley becomes more arid and devoid of trees. Nevertheless even there it is still rich with spring wildflowers. In spring, in late February – April Shell Creek Road becomes an important destination for wildflower enthusiasts and especially – for photographers. Diverse scenery and diversity of plants provide plenty of excellent views. California poppy (Eschscholzia californica Cham.) grows in diverse conditions in the western part of Northern America from Oregon in the north to Baja California in the south. Even a single orange (often – yellow) flower of this plant emits fragile and exquisite beauty but there are locations where one can see millions of these beautiful flowers close together. California poppy belongs to family of poppies and it certainly looks like a poppy with its solitary, bright colored cup of large, fragile petals and ternately divided, segmented leaves. It is hard to describe the gorgeous color of this flower to those who have not seen it in life – it is brilliant, clear orange or light orange color. This hue is of rare beauty and has given a deserved fame to this flower. California poppies flower in spring – in late February – April. Often there happens a repeated flowering in autumn, September. These flowers love grassy, open areas – such as arid grasslands of Californian intermontane valleys, seaside meadows or talus of steep hillsides. In good conditions flowers can be perennial, in colder conditions – annual. These poppies love sun and sandy, well-drained soil, they often re-colonize clearances after forest fires. Flowers are drought-resistant – in spring they cover areas which in summer seem to be nearly lifeless. Before the night the flowers close and do not open if weather is cloudy. 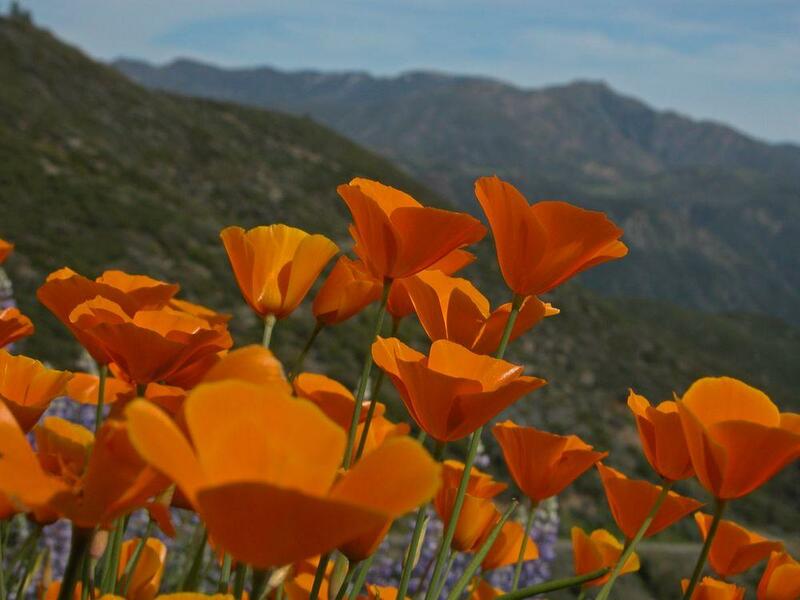 This is important factor when considering a visit to California poppy meadows. California poppy is highly variable and there is some confusion regarding the number of subspecies or even division in several distinct species. One easily noticeable variation is color of flowers which can alternate between bright yellow and deep orange. 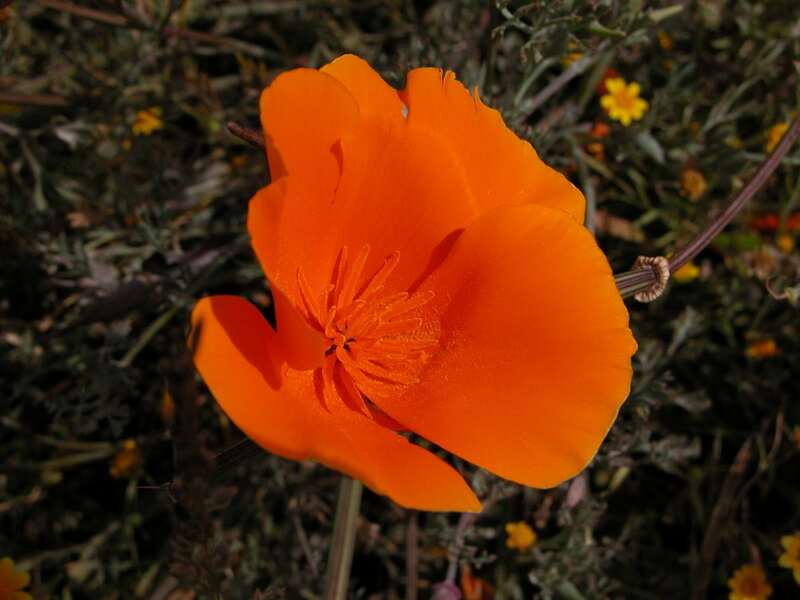 Although California was visited by white people since several centuries, the bright orange poppy was described by scientists only in the early 19th century. In the early 19th century Russian empire organised several rather successful voyages around the world to extend the political and economical contacts of empire. During such voyages groups of scientists traditionally were taken aboard. Brig "Rurik" made its trip in 1815 – 1818 and the botanist of the team was German Adelbert von Chamisso but enthomologist – Baltic German from the present day Estonia Friedrich von Eschscholtz. Both became close friends during the expedition and when Chamisso described the beautiful orange Californian flower, he named the plant after his friend – Eschscholzia californica Cham. Letter "t" somehow is lost from the family of Eschscholtz in the Latin name of the plant. Great naturalist John Muir wrote in his memoirs: "Go where I would, east or west, north or south, I still plashed and rippled in flower-gems". 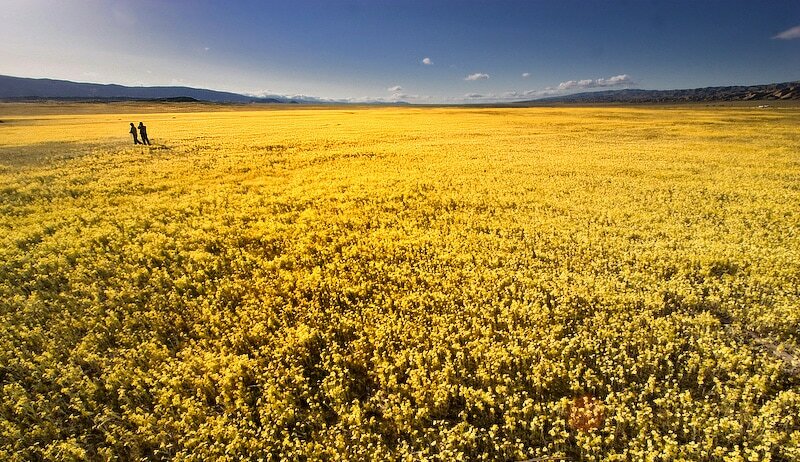 In 1868 he was privileged to see something what we won’t see anymore – the endless sea (400 miles long and 30 miles wide) of spring flowers of Central Valley in California. Nearly all of this unique grandeur is gone now, meadows have been replaced by pastures, roads and buildings. Meadows consist of numerous flowers but one of the most prominent ones are poppies. California poppy meadows belong to most impressive wildflower displays of the world. Their unusually clear and brilliant color seems to come from another, better reality. This flower has created a passion what is rare elsewhere in the world: many Californians are obsessed with "wildflower hunting" – search of beautiful meadows, photographing and just pure enjoyment of beauty. There are quite many species of wildflowers and many people here enjoy learning to distinguish them. This is really nice retreat from the stressed rhythm of city life. 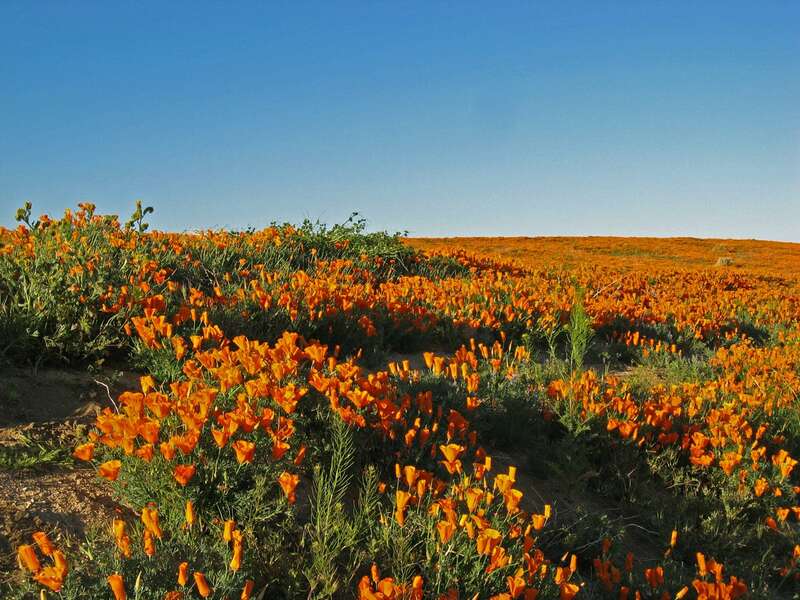 Law prohibits to pick or uproot a California poppy in wild. But sometimes really nice poppy meadow without hiking trails might soon get a dense net of trails. If one car stops at the roadside and people walk out in the meadow, soon there stop ten more cars and people disperse in meadow. 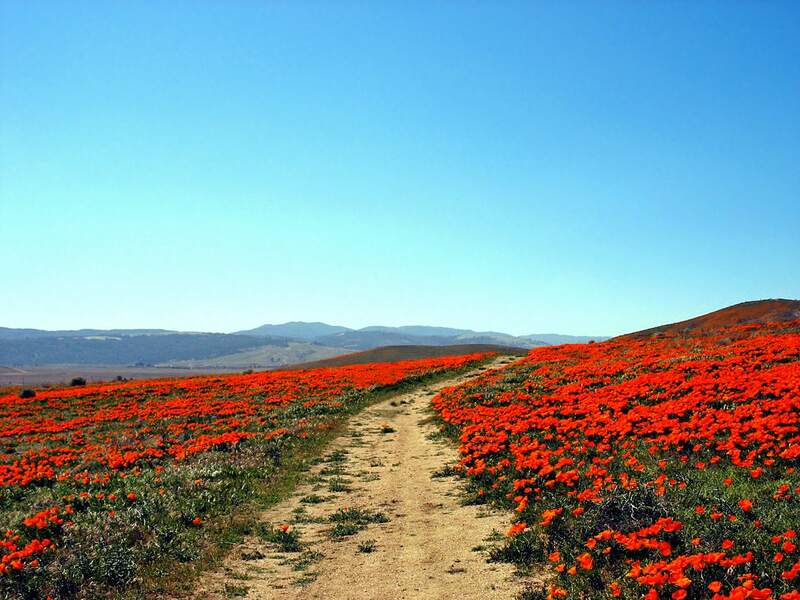 Due to this Wondermondo advises to enjoy poppies in places which are suited for this: Antelope Valley Poppy Reserve, trails around Figueroa Mountain, Hite Cove trail, Point Buchon Trail. Although there might be more people, there are also more chances to see untouched poppy meadows. 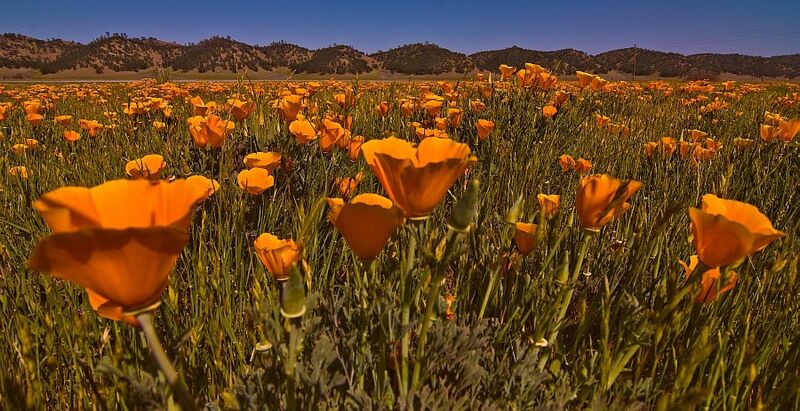 Visitors face one potential danger while walking in California poppy meadows: rattlesnakes. Maybe there is little chance to meet them in late February – March, but you never know. California’s state and national parklands have preserved the glorious natural wonders of this state. These wonders have been chronicled in this guide by John McKinney, hiking columnist for the Los Angeles Times for 18 years. In this guide, McKinney, known to his readers as “The Trailmaster,” has identified the finest hikes that each parkland has to offer. California’s National Parks describes over 150 walking adventures in famous national parks as well as those in federally-managed national monuments, preserves, and recreation areas. This is the first lavishly illustrated and easy-to-read layperson’s guide to California’s unique plants and diverse plant communities. Its readers will enjoy a wide range of high quality drawings and beautiful color and black-and-white photographs of California’s plants and landscapes. They will also learn the history of how California’s vegetation has changed due to human activities over the past two centuries. Really good info. I just wish the photos were not so heavily edited.